And if you are journeying into an Internet dead zone, but still want to keep up to date on the shows your TiVo BOLT has recorded, we’ve got you covered! Along with out-of-home-streaming, TiVo BOLT users now can download programs from their TiVo BOLTs to compatible mobile devices while inside these users’ home network. Stock up on seasons of your latest and greatest favorites before embarking on Internet-less adventures! Rollout of this feature begins today and will be completed within the next week. 1 Compatible tablets and mobile devices consist solely of an iPad®, iPhone® or iPod touch® device running iOS 7.0 or later, or an Android mobile device running 4.1 or above with a non-Intel or AMD chipset (sold separately). Not all recorded content can be streamed or downloaded to a tablet or mobile device (due to copy protection assigned by content provider and/or other technical limitations). Some recorded content can only be streamed/downloaded to your tablet or mobile device while you are on the same network as your TiVo BOLT. Out-of-home streaming (a) will support streaming to only one of your devices at a time and (b) may not be available for all recorded content. © 2016 TiVo Inc. All Rights Reserved. 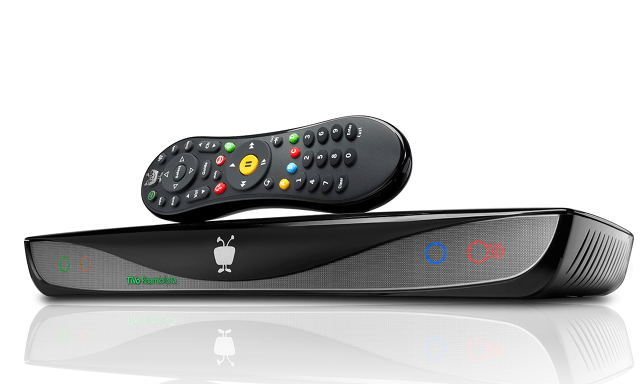 TiVo, the TiVo logo, the TiVo silhouette logo, and TiVo BOLT are trademarks or registered trademarks of TiVo Inc. or its subsidiaries worldwide. Android is a trademark or registered trademark of Google Inc. iPad, iPhone and iPod touch are registered trademarks of Apple Inc.